Hi, could you tell me where can I find out about some figures that I have. 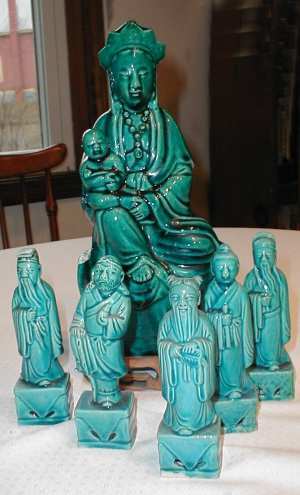 It appears to be a Madonna figure, with some other figures also ... the principal figure, the Madonna, is on a carved wood base. It is a teal or aqua color. When I further examined them I did see what may say "China" on the base of the large figure. The small figures have no marks at all on bottom. These figures are quite famous figures in the Chinese mythology. The large figure with the child in her arms is Guanyin - the Goddess of Mercy. The five small ones are five out of a set of eight "Immortals". They are all well know in the Chinese history of myths and stories and are distinguished by the attributes they carry.